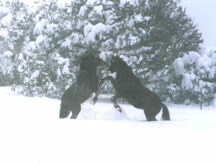 Are these horses playing, figuring out who is boss, or trying to kill each other? 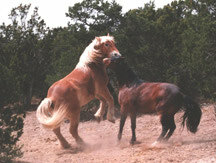 Click here for pictures and videos of horse fights and tips on how to read the combatants' emotions. 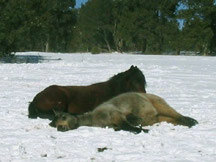 The animal control people out here in New Mexico say they get lots of calls from people who mistakenly think they see dead horses lying around. Really, honest, lots of city folk think horses never lie down until they kick the oat bucket! Sunny in front; Chester, a Paint gelding, behind her. If there were horse snoozing competitions, Sunny would be a contender. Video of Sunny and Viking sleeping.Viking rouses himself from time to time to check things out. Most mares like to go kissy, kissy with stallions, but when the object of her affections suggests going further, the mare usually says no. A stallion who is safe to live in a pasture with mares should accept "no" for an answer every time -- no matter how rudely she tells him to buzz off. I can imagine him asking, "OK, how about in fifteen minutes?" "Is it tomorrow yet?" "I don't mind your great big tummy -- we haven't done it for ten months!" Video: In the foreground, Sunny, a registered Horse of the Americas Spanish mustang, kisses Danny, a grade Percheron. Behind her, Pinta is swishing her tail at Viking, who is the sire of her unborn foal. Sunny is a maiden mare, which is why she doesn't say "no" with as much vigor as Pinta. Her squeals and foot stamping tell Danny "not today." © 2007 Carolyn M. Bertin. All rights reserved.